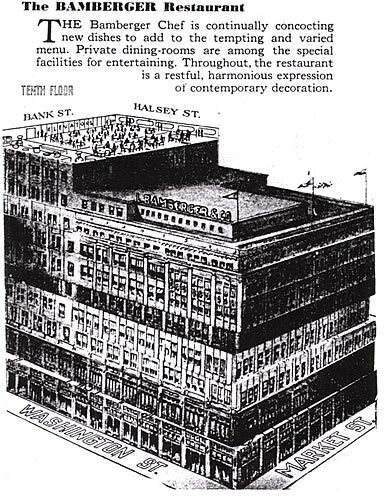 In 1929, Newark's premier downtown department store, L. Bamberger & Co., reached its peak as one of the greatest, if not the greatest department store in America. It was among the nation's four top-ranking department stores in sales volume with over $38 million ($385 million in today's dollars), and unquestionably the most diversified among them. 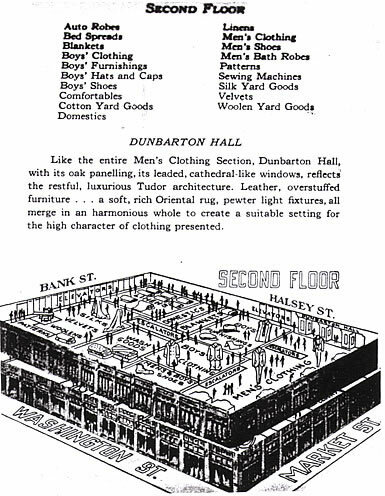 Bambergers offered a wealth of special customer services that included: a consulting dressmaker ... cutting and fitting service ... a bridal advisor ... clothing advisory service ... personal shopping service ... interior decorating ... film rental library ... fishing and hunting licenses ... parcel checking ... Post Office ... local time tables ... theatre tickets ... telegrams ... circulating library ... Newark Public Library Branch ... also fur and drapery storage and glove cleaning. 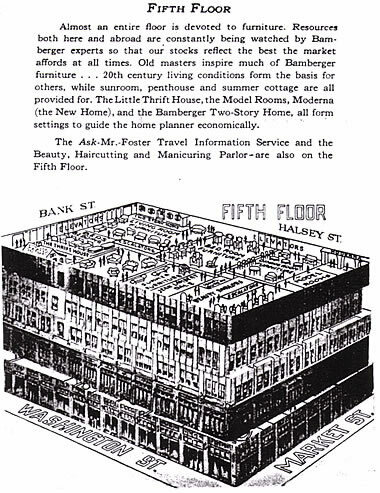 Bambergers was a virtual city unto itself with its internal post office, power generation capabilities, toll-free telephone service from suburban cities, a corps of 24 specially-trained operators taking incoming calls, mostly telephone orders, who would take orders as small as a spool of thread, with the store making overnight delivery on one of the 192 motor trucks in the Bamberger delivery fleet. The Bamberger deliver trucks disposed of an average of 20,000 packages every day to customers in 542 towns. If you were lucky enough to own a car in 1929, you could get free parking at one downtown Newark lot, or with a store-stamped voucher, or reduced rate parking as a Bamberger customer at two other downtown lots. Embroidered handkerchiefs ... names woven ... engraving of stationery ... engraving of jewelry and silver ... embroidering of linens ... making of dressmaking accessories. Crocheting, tatting, knitting ... dressing boudoir dolls ... lamp shade making and painting ... needlepoint ... quilting ... rug making ... smocking ... trapunto work (raised quilting). Cutlery ... hosiery ... umbrellas ... eyeglasses ... gloves ... jewelry ... corsets ... shoes ... oriental rugs ... furs ... luggage ... restringing of tennis rackets. 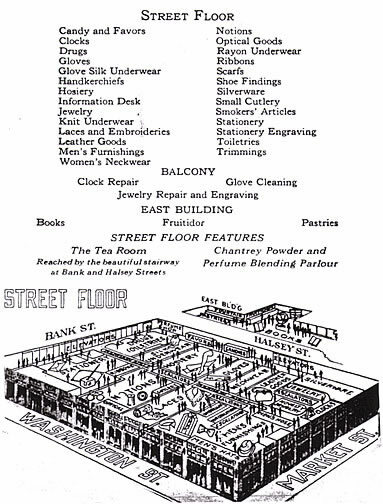 The entire square footage of the store was 1,240,000 square feet. Each selling floor was approximately 80,000 square feet. 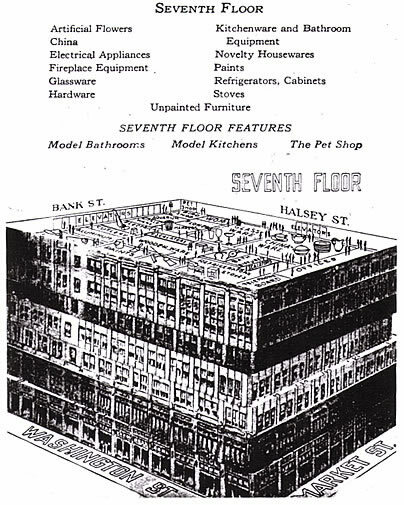 The store towered 16 stories above street level and reached four stories below street level. 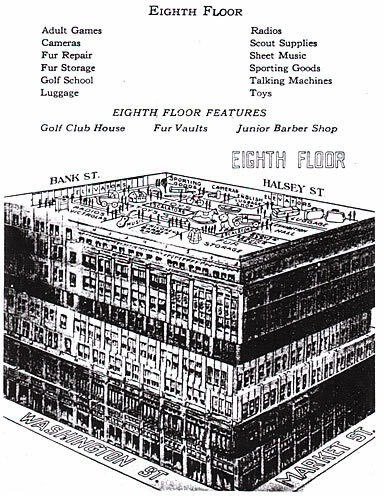 The above-ground floors included eight selling floors. 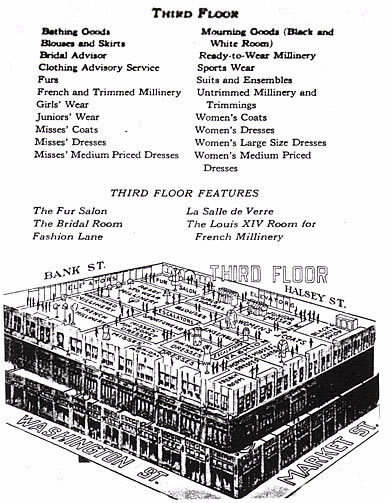 The four basement levels included two selling floors. 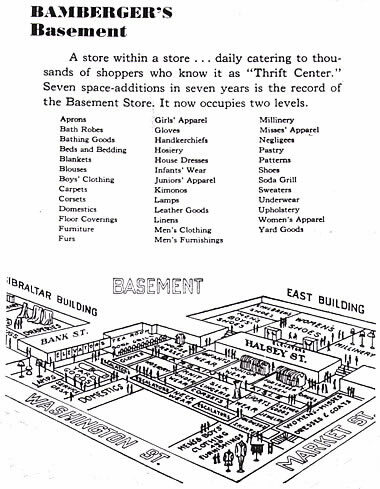 One of the basement-level selling floors tunneled under Halsey Street into the building which later became Ohrbachs. 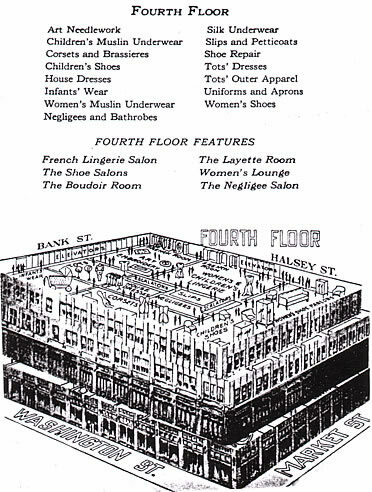 Early in 1929, while still owned by Louis Bamberger, who oversaw its daily operations from his eleventh floor office in the corner of the building marked by Washington and Bank Streets, he provided an in-store Tour Guide which gave customers an overhead view of every sales floor and the precise location of each department located on that floor. 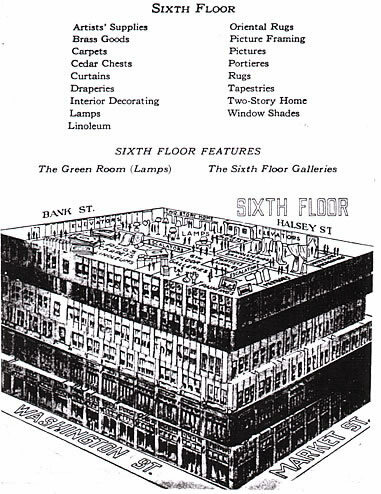 I recently acquired a copy of the floor illustrations from that 1929 Bamberger Guide and offer them here, perhaps for their first public exposure, nearly three quarters of a century after their original issue to Downtown Newark shoppers.